Every once in a while I stumble on a story I didn't know I needed until I read it. Sometimes the right book comes into your life at the right time. Such an empowering story. Leah and her boyfriend are dancing in the parade as the Cinderella and her prince until the dragon grabs him and takes him away. Leah doesn't stand still, she runs after him and gets transported into a whole different world with them. 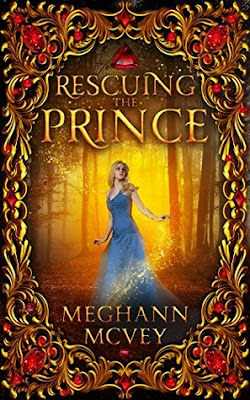 She finds herself in the middle of a strange land, where she is mistaken for a missing princess. She agrees to stay for a while until she knows how to find Garry. Not only she is a princess now, but she is also trusted in the middle of castle life and she even discovers that she has some kind of magic. Queen send her to learn how to control and use that magic (I love magic schools :)), however, when she returns prematurely she discovers the kingdom in war. The road to rescuing her boyfriend is a long one, but not all is as it seems. Not only Leah goes on an adventure there, she discovers herself, her strength and starts to question their relationship, especially when handsome soldier come into the picture. The story is full of adventure and magic. I love the world building, it paints a very vivid picture, with interesting mythology, cool magic, and political intrigue. Highly recommend to anyone who likes strong heroines and fairytale-ish high fantasy!